Michael eldest son of Nita and Ants (both dec). 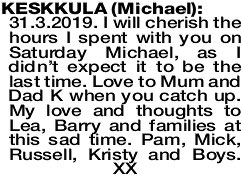 Passed away peacefully on the 31st March after a brave battle with an ongoing illness at Sir Charles Gairdner. 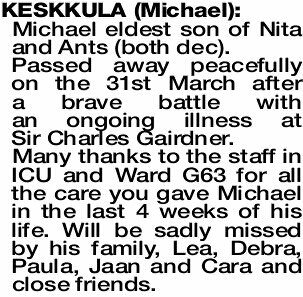 Many thanks to the staff in ICU and Ward G63 for all the care you gave Michael in the last 4 weeks of his life. 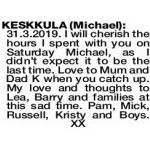 Will be sadly missed by his family, Lea, Debra, Paula, Jaan and Cara and close friends.